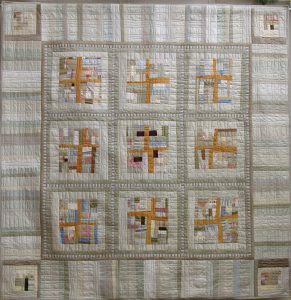 As individual quilt-makers and teachers, Fox and McLeod have each developed our own methods for working with rescued materials. These methods reflect our distinct personalities, and have led each of us to our own unique working styles. Between the two of us, we bring a wide range of experience and problem solving skills to share with class participants. In our classes, we show specific and basic techniques while encouraging alternative thinking about how one might proceed on one’s own quilt-making path, once the basics are firmly in place. We have several simple ‘Recipes’ for working with silks and rescued materials, and we show how the recipes can be altered for special circumstances and particular ideas. Our class plans take into account that participants in most classes will come in with a wide range of skills and interests—we structure our class offerings to honor these individual differences. 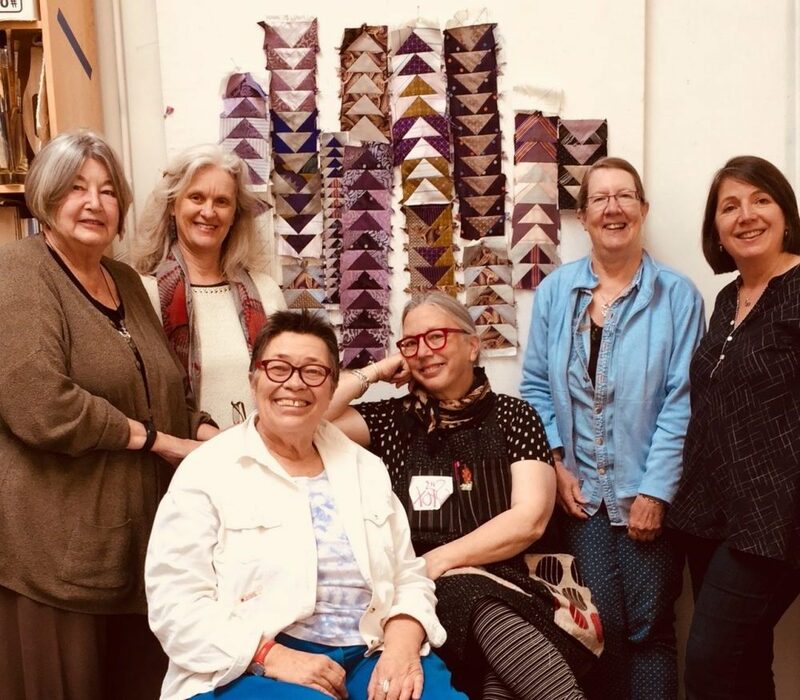 Our teaching format is based on Examples and Exercises so each participant can see, make and take home a variety of samples, aka: “art parts.” Our classes focus on building solid technical skills and gaining simple mastery in working with unconventional quilting materials. We bring both work-in-progress samples and finished quilts to illustrate the techniques we are teaching. Our teaching goal is for each participant to gain confidence in working with silks and other unusual materials, so they can confidently move forward in incorporating these materials into their own quilt-making toolkit. Working together, Fox and McLeod can accommodate a variety of skill levels within one class setting... We strive for a relaxed, yet productive teaching environment, in which we also share laughter as an essential ingredient throughout the day. We love to teach! Please contact us to book a class or workshop for your store, guild, group or event, or with any questions you may have. Silk may be one of the most beautiful materials, but it can also be one of the most challenging to work with! They say that “knowledge is power” and for the quilt-maker who wants to work with silk, knowledge is also the key that opens the door to freedom and creativity. Over the years, through the trial and error of making dozens of silk quilts, we have learned many systems and strategies—these are tips, tricks and techniques that will enable you to enjoy the process and to succeed in using silks. We always bring lots of samples and examples for you to study, and we share simple exercises that will give you confidence to continue working on your own. The day will start with an overview of tactics we use for incorporating silks in our own quilts, demonstrate some reliable construction techniques, and include time to discuss the best way to exploit your own personal stash of silks. Working with your stash, you’ll construct “art parts” that can be incorporated into either small and larger projects. 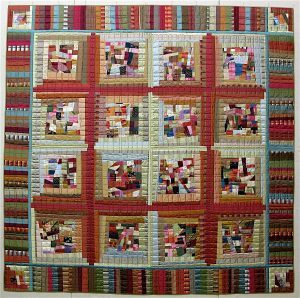 Our goal is to send you home with a game plan for how you will develop your lovely art parts into a full blown quilt. Demonstrations will include: The fiber ID burn test; How to deconstruct a necktie; and 3 Methods for stabilizing silk. Foundation piecing silk directly onto a muslin backing will address a lot of the problems that people tend to have when working with silk. Unlike paper piecing, in which the paper is torn away after stitching, foundation piecing locks your silk onto a fabric base which then stays in place, thus protecting the silk edges from unraveling. This foundation layer also helps to stabilize the looser and more fluid qualities inherent in many silks. 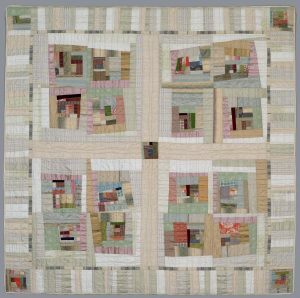 Julia McLeod’s expertise with precision piecing on foundation fabric goes beyond accurate sewing—she’ll share how she develops color stories for her own quilts and demonstrate some simple methods for “not messing up” during color placement. 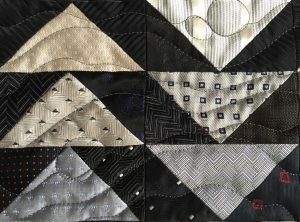 You’ll also see how foundation piecing can “up your game” when used in combination with other techniques in creating a quilt. In this class, we’ll spend the day working with commercially printed foundation fabric, learning the basic procedure using the Flying Geese motif and practicing variations on the technique throughout the day. Demonstrations will also include: How to design & make your own foundation fabrics; Changing scale to create dynamic effect; and Using this technique to create more abstract and/or complex designs. 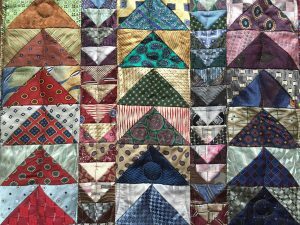 Improvisational piecing is not new, but the “rules” for sewing silk, linen or wool in an improvisational manner call for a different level of attention than does working with standard quilters cotton. We will show you how silk, linen, wool and other fibers are handled differently than cotton—once you know the distinct qualities of each, you’ll be ready to use & mix these disparate fabrics with confidence. Most of the salvaged materials in OUR stashes come from neckties we have picked apart, scraps we’ve retrieved from drapery workrooms or clothing manufacturers, or from deconstructed domestic textiles. As a result, we’ve become adept at using smaller and oddly shaped pieces, which we then cobble together to make delicious “art part” components. 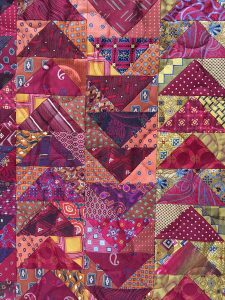 We’ll show you how– by deftly sharing similar colors and/or related patterning between the different types of components– you can combine several varieties of art part recipes together into one project, resulting in a quilt that has vitality and spirit. We’ll demonstrate several of Fox’s favorite piecing recipes, developed over decades of studying vintage and traditional block styles, and then updated into some modern variations. You’ll leave this class with “seedling art parts” (aka: components for your next Improv or Medallion style quilt) and a BONUS “menu planner” to guide you toward turning those art parts into tasty and satisfying quilt projects!